The terms “we”, “us”, “our”, “The Medical Algorithms Company” , “TMAC” and “Medal” means The Medical Algorithms Company Limited, a UK company with Company Number 06189785 and registered office at 95 Aldwych, London, United Kingdom. "System“ means any Service or technology of the Website either now, in the past or in the future. This includes, but is not limited to algorithms, calculators, documentation, description, interpretation, web-based emails, links or any function or derivation thereof. BY ACCESSING OR USING THE SITE, YOU AGREE TO BE BOUND BY THE TERMS AND CONDITIONS SET FORTH BELOW. IF YOU DO NOT WISH TO BE BOUND BY, OR DO NOT AGREE WITH, THESE TERMS AND CONDITIONS, YOU MAY NOT ACCESS THE SITE OR USE ANY WORK OF THIS SITE. This Website is run by The Medical Algorithms Company Ltd. (TMAC). TMAC reserves the right, in its discretion, to change or modify all or any part of this Agreement at any time, and such modification shall be effective immediately upon posting the modified agreement on the site. Please review the Agreement periodically to be aware of modifications and your continued access or use of the Site shall be deemed your conclusive acceptance of the modified agreement. If at any time the terms and conditions of this Agreement are no longer acceptable to you, you should immediately cease all use of the Service and delete any previously derived work. We provide users of The Medical Algorithms Company Sites with a very large number of medical algorithms and calculators, and additionally several useful Services and features accessible on the web as well as from mobile applications. We will offer our platform on a subscription basis (when subscription will have started). Subscription can be for one or more specialties of calculators, or for the entire platform content. We reserve the right to change subscription process from time to time without advance notice. You may view information provided through the Services online, download individual calculator results to your computer or mobile device for later reading or print a copy, provided that you do not remove any copyright notices or warning messages from our materials. TMAC uses reasonable endeavours to check the accuracy of the professional information published on this Site. You should note however that we do not warrant that such information will be error free and the User acknowledges that the algorithms, information, products, and services published on this Website may include inaccuracies or typographical errors. THE SERVICE AND THE CONTENT ARE DISTRIBUTED ON AN "AS IS, AS AVAILABLE" BASIS. NONE OF THE MEDICAL ALGORITHMS COMPANY, THIRD PARTY PROVIDERS OR THEIR RESPECTIVE AGENTS MAKES ANY WARRANTIES OF ANY KIND, EITHER EXPRESS OR IMPLIED, INCLUDING, WITHOUT LIMITATION, WARRANTIES OF TITLE OR IMPLIED WARRANTIES OF FITNESS FOR A PARTICULAR PURPOSE, WITH RESPECT TO THE SERVICE, ANY CONTENT OR ANY PRODUCT OR RESULT. Service is intended ONLY for qualified professionals. Service does not constitute legal or medical advice. Any results derived are for guidance only are no substitute for medical or legal advice. If you are a healthcare professional, you should exercise professional judgment in evaluating any information or result. We encourage you to confirm the information made available or otherwise obtained through the Services with other sources before undertaking any treatment based on such information. If you are a consumer, you should not use our Service, or rely on the information as professional medical advice, or use it to replace any relationship with your physician or other qualified healthcare professional. For medical concerns, consumers should always consult their physician or other qualified healthcare professional, or in serious cases, seek immediate assistance from emergency personnel. We shall not be liable under any circumstances for any losses or damages whatsoever arising from your inability to access any of the pages on the Site or mobile application or that you may incur as a result of such Content, nor for any errors or omissions in the Content. Use of and reliance upon any Content is entirely at your own risk. You may print, store or download from the Site the results of your analytics, using the features provided on the Site, provided that you keep intact all copyright and other proprietary notices and observe your confidentiality requirements. You are not allowed to create other derivative works from the Content. You may not reverse engineer, disassemble, decompile or translate any information in the Service and the Content, or attempt to derive the source code of such software. You may not engage in systematic or automated retrieval of Content from the Site without our prior written permission. You may not attempt to gain unauthorized access to any portion of the Site. You are prohibited from doing any act that TMAC in its absolute discretion may deem to be inappropriate or unlawful or brings into disrepute our good name or business reputation. We reserve the right to deny service to any user or subscriber for any reason. Subscribers whose Service is terminated by us have the right to a prorated refund of their last subscription payment. ● transmit any viruses, worms, defects, Trojans or other items of a contaminating or destructive nature through the Service. We may contact you when you as an individual user access more than 100 analytics in one month, or in cases where we suspect any unauthorized or unethical use in our sole discretion. Except as expressly permitted in this Agreement, you may not modify, publish, transmit, reproduce, create derivative works from, distribute, perform, display, sell, transfer or in any way exploit any of the Content or Material, in whole or in part. You also agree not to circumvent, disable or otherwise interfere with any security related features of the Service or the Content, including features that prevent or restrict use or copying or that enforce limitations on use. This clause shall survive expiration or termination of this Agreement. By registering and / or subscribing to the Service, you represent and warrant that you are of legal age in the country of your residence and legally able to enter into a contract. By using the Service, you represent and warrant that all registration information you submit is complete, truthful and accurate. The registration profile for the Service must describe you, an individual person. Creating an account under automated means or under false or fraudulent pretences constitutes unauthorized. If you wish to view or change your profile, you can do so via the “Settings" option on the site. You agree to keep the password for your access confidential and agree not to permit anyone else to have access to it. Furthermore you agree to be fully responsible for all activities that occur under your password. You agree to immediately notify us of any unauthorized use of your password. You agree and commit not to violate any applicable local, state, national or international law, statute, ordinance, rule, regulation or ethical code in relation to your use of the service. You agree to notify us immediately of any unauthorized use of your subscription or any other concern of your account security. Should you wish to subscribe (after subscription is activated) to get full access to all our algorithms and calculators, you agree to pay the subscription fee at the rates in effect when the charges were incurred. For your subscription you will be charged the rate currently published on our website. If there is a new rate, you will be charged the new rate at the beginning of your next billing cycle. You have to go into your payment account (PayPal or your credit card) and approve the new amount charged. If you do not approve the new amount charged, your subscription will end. Should the subscription rate change, the changes will be posted on our website, and subscribers will get an email at least 6 weeks before the end of the current billing cycle giving enough time to cancel the subscription. When you subscribe to the Services, your subscription will automatically renew and you will be charged at the start of each annual billing cycle. Upon charge of the subscription fee, that charge is final. Should you terminate the Service, you will not get a refund for the unused subscription period. Your cancellation of your subscription will be effective at the end of the current billing cycle. You will have access to our Services and your stored content until the end of the billing cycle. TMAC reserves the right, in its sole discretion, to restrict, cancel, suspend or terminate your access to all or any part of the Service at any time for any reason without prior notice. Conversely, you may terminate your subscription of the Service at any time, for any reason. Once your subscription terminates, you will have no right to use the Site or any of its content and functionalities. Upon termination of your subscription, all your stored data will be deleted and cannot be retrieved. In case we terminate or deny Services to a user, we usually contact the user to inform us about his use cases. 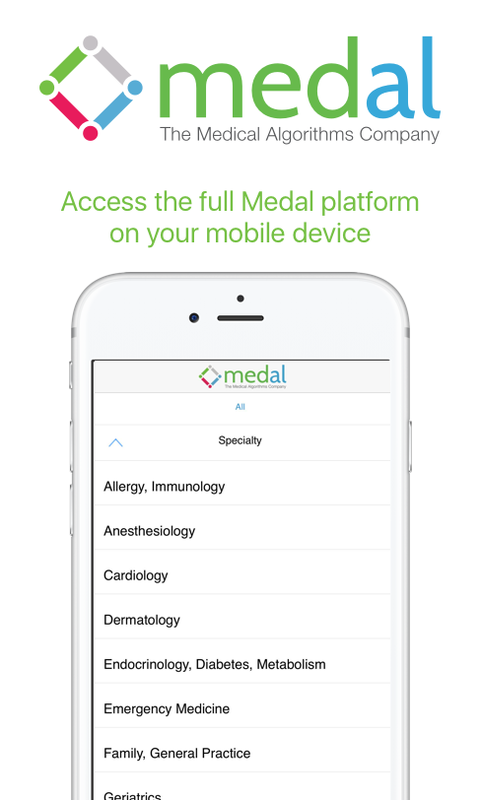 If your subscription ends, your information (MyMedal, Consult Evidence Report, including saved algorithms and results) stored on the website will no longer be available to you. You agree that we have the right to delete all data, files or other information that is stored in your account if your account with the company is terminated, for any reason, by either you or us. Please also note that when cancelling a subscription you will not receive a refund for any unused time. If you have purchased an individual subscription, the log-in credentials are personal to the individual named on the account and cannot be shared with or used by any other individual, or entity. The sharing of passwords, login information, or user identification is forbidden. We reserve the right to monitor Customer's use of the Service to ensure compliance with this Agreement and prevent hacking, unauthorized or fraudulent use. We shall not be liable to you or any third party for any reason including any termination of your account, any associated email address, or access to the Services or any portion thereof. All Content included on the Website, unless uploaded by a User, is the property of Medal. You acknowledge and agree that our Service contains proprietary information protected under UK, EU, U.S. and international intellectual property laws or other proprietary rights and laws. You agree not to access the Services by any means other than through the interface that is provided by us. Nothing in these Terms and Conditions shall confer any rights upon any third party. Where expressly indicated, certain Content and IP subsisting therein may belong to other parties. ICD-10 codes are used by permission of WHO, from: International Statistical Classification of Diseases and Related Health Problems, Tenth Revision (ICD-10) 2010 Edition. Vols. 1-3., World Health Organization, Geneva 2011. The Medical Algorithms Company is committed to complying with UK, EU, U.S. and international copyright laws and to respond to claims of copyright infringement. TMAC will promptly process and investigate notices of alleged infringement and will take appropriate actions. When content from original works is included on our site, we provide references to the intellectual property of the authors/publishers, or the public domain when appropriate. 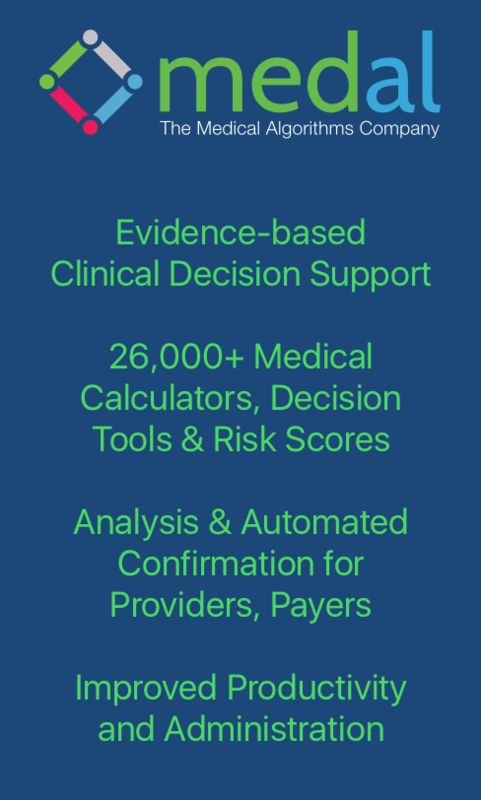 Our Website transforms published algorithms into interactive, dynamically-scored calculators that we believe qualify for transformative fair use: from a static list to a live calculator with both the total score as well as diagnostic/prognostic information, description and suggested interpretation. If you believe that your work has been copied and posted on the Service in a way that constitutes copyright or trademark or Intellectual Property infringement, please contact us in the "Contact Us" sections of the website with the following information: (a) an electronic or physical signature of the person authorized to act on behalf of the owner of the copyright or trademark interest; (b) a description of the copyrighted work(s) or trademark(s) that you claim has been infringed; (c) a description of where the material that you claim is infringing is located on the website or mobile application; (d) your address, telephone number, and email address; (e) a written statement by you that you have a good faith belief that the disputed use is not authorized by the copyright or trademark owner, its agent, or the law; and (f) a statement by you, made under penalty of perjury, that the above information in your notice is accurate and that you are the copyright or trademark or IP owner or authorized to act on the copyright or trademark owner's behalf. We reserve all of our other rights not granted in these Terms and Conditions. You agree to comply with any copyright notices, information, or restrictions contained in any Content available on or accessed through the Service. Any other use of our Service or Content should include: © 2018 The Medical Algorithms Company, all rights reserved. We welcome links to the Site. You may establish a hypertext link to the Site, provided that the link does not state or imply any sponsorship or endorsement of your site by The Medical Algorithms Company. We grant a nonexclusive, limited permission (“Permission”) to display the Trademarks contained in The Medical Algorithms Company domain names, brand names and logos to the owner(s) of any web sites that would like to develop a link between their site and the corresponding website owned by The Medical Algorithms Company (“The Medical Algorithms Company Site”). Links to a The Medical Algorithms Company Site other than the one using The Medical Algorithms Company domain names, brand names or logos are not permitted. Some of the pages on the Site or mobile application may include advertising banners and other promotional messages that link to other Internet Site or mobile applications. We are not responsible for content of advertisements, hyperlinks from advertising or the content of other Internet Site or mobile applications. The Medical Algorithms Company aims to keep the Site available twenty-four (24) hours a day, seven (7) days a week and to maintain saved information. However, we shall not be liable for lost altered, or corrupted information or non-availability of the Site. We do not warrant that the Service will be uninterrupted or error-free or that defects in the Service will be corrected. The Service depends on various factors such as software and hardware, either our own or those owned and/or operated by our contractors and suppliers. We accept no liability for any disruption or non-availability of the Website resulting from external causes including, but not limited to, ISP equipment failure, host equipment failure, communications network failure, power failure, natural events, acts of war or legal restrictions and censorship. The Service is provided "as is" and on an "as available" basis. We give no warranty that the Service will be free of defects and/or faults. To the maximum extent permitted by the law we provide no warranties (express or implied) of fitness for a particular purpose, accuracy of information, compatibility and satisfactory quality. The Medical Algorithms Company reserves the right to alter, suspend or discontinue any part (or the whole of) the Website including, but not limited to, the products and/or services available. For the removal of any doubt, we may terminate or prevent your use of the Service or any other aspect of TMAC at our sole discretion for any reason and for any period of time. We may from time to time send you information about products and services. We don't offer any warranty or guarantee related to the Services that we provide. We specifically disclaim any warranties, express or implied, including implied warranties of merchantability or fitness for a particular purpose. YOU ASSUME TOTAL RESPONSIBILITY AND RISK FOR YOUR USE OF THE SITE AND THE INTERNET. THE MEDICAL ALGORITHMS COMPANY PROVIDES THE SITE AND RELATED INFORMATION "AS IS" AND DOES NOT MAKE ANY EXPRESS OR IMPLIED WARRANTIES, REPRESENTATIONS OR ENDORSEMENTS WHATSOEVER (INCLUDING WITHOUT LIMITATION WARRANTIES OF TITLE OR NONINFRINGEMENT, OR THE IMPLIED WARRANTIES OF MERCHANTABILITY OR FITNESS FOR A PARTICULAR PURPOSE) WITH REGARD TO THE SERVICE, ANY SERVICE PROVIDED THROUGH THE SERVICE, AND THE MEDICAL ALGORITHMS COMPANY SHALL NOT BE LIABLE FOR ANY COST OR DAMAGE ARISING EITHER DIRECTLY OR INDIRECTLY FROM ANY SUCH USE. IT IS SOLELY YOUR RESPONSIBILITY TO EVALUATE THE ACCURACY, COMPLETENESS AND USEFULNESS OF ALL ALGORITHMS, RESULTS, SERVICES AND OTHER INFORMATION PROVIDED THROUGH THE SERVICE OR ON THE INTERNET GENERALLY. You agree to indemnify, defend and hold The Medical Algorithms Company, our respective officers, directors, employees, agents, licensors, suppliers, affiliates, and their respective officers, directors, owners, agents and information providers (collectively, the "The Medical Algorithms Company Parties") harmless from and against any and all claims, legal action, liability, losses, damages, costs and expenses (including accounting and attorneys' fees) incurred by any of the The Medical Algorithms Company Parties in connection with any Material or use or alleged use of any Content or Service, including any use under your password by any person, whether or not authorized by you. Your sole remedy for dissatisfaction with the Site or mobile application-related Services is to stop using the Site or mobile applications and Services. The Medical Algorithms Company and the authors make no claims of the accuracy of the information contained herein; and the suggested information is not a substitute for clinical judgment. Neither The Medical Algorithms Company nor any other party involved in the preparation of this program shall be liable for any special, consequential, or exemplary damages resulting in whole or part from any user's use of or reliance upon this material. The liability of The Medical Algorithms Company Parties is limited to the total value of the subscription fee paid. You may use The Medical Algorithms Company apps on your mobile devices. These apps and mobile Services may not be compatible with all mobile devices, carriers, and services, and we do not make any representations or warranties regarding such compatibility. You understand that you may be charged by your wireless service provider in connection with the use of our Service. Fees and charges may apply to your use of, and access to, the mobile Services, and you are solely responsible for all such fees and charges. This Agreement constitutes the entire agreement between you and The Medical Algorithms Company with respect to, and applicable to, your use and prior use of the Services. If any provision of this Agreement is held invalid, illegal or unenforceable, such provision shall be interpreted in such a manner as to preserve, to the maximum extent possible, our intent. The validity, legality and enforceability of the remaining provisions shall not in any way be affected or impaired thereby, and such decision shall not affect the validity, legality or enforceability of such provision under other circumstances. In the event that any party to these Terms and Conditions fails to exercise any right contained herein, this shall not be construed as a waiver of that right. If any part of these Terms and Conditions is determined to be invalid or unenforceable pursuant to applicable law, then the invalid or unenforceable provision will be deemed superseded by a valid, enforceable provision that most closely matches the intent of the original provision and the remainder of the agreement shall continue in effect. Any rights not expressly granted herein are reserved. Neither the course of conduct of the parties nor trade practice shall act to modify any provision of this Agreement. We may assign our rights and duties under this Agreement to any party at any time without notice to you. This Agreement and the relationship between you and The Medical Algorithms Company shall be governed by and construed in accordance with the Law of England and Wales and The Medical Algorithms Company and you agree to submit to the exclusive jurisdiction of the Courts of England and Wales. You agree that you will not bring any such action, suit or proceeding in any court other than the Courts of England and Wales in the City of London. In the event that any of these terms are found to be unlawful, invalid or otherwise unenforceable, that term is to be deemed severed from these terms and conditions and the remaining terms and conditions shall survive, remain in full force and effect and continue to be binding and enforceable. Terms shall apply only within jurisdictions where a particular term is legal. As a consequence of the global nature of the Internet, you agree to comply with all local rules regarding user conduct on the Internet and acceptable content. Use of our Service is unauthorized in any jurisdiction that does not give effect to all provisions of these terms and conditions, including without limitation this paragraph.